This issue has some very good stories, but also a couple that just didn't do anything for me. Jeffrey Ford - Thanksgiving - 4 stars - Maybe 5 stars? Uncle Jake has been attending a family Thanksgiving dinner for years, but whose uncle is he? Who is he? What is he? It turns into a mild horror story. Y. M. Pang - The Lady of Butterflies - 5 stars - The "First Sword", personal guard, of the emperor of a Japanese/Chinese style empire discovers an unusual woman in the palace garden. The guard ends up s This issue has some very good stories, but also a couple that just didn't do anything for me. Jeffrey Ford - Thanksgiving - 4 stars - Maybe 5 stars? Uncle Jake has been attending a family Thanksgiving dinner for years, but whose uncle is he? Who is he? What is he? It turns into a mild horror story. Y. M. Pang - The Lady of Butterflies - 5 stars - The "First Sword", personal guard, of the emperor of a Japanese/Chinese style empire discovers an unusual woman in the palace garden. The guard ends up sacrificing everything that she holds dear to save the woman. Sean McMullen - Extreme - 4 stars - Extreme sports? Extreme life style? Extreme risks? Nothing is too extreme! Hanus Seiner - The Iconoclasma - 2 stars - A life-form is discovered that is created by drawing it. It tries to take over the universe. Really? Abra Staffin-Wiebe - Overwintering Habits of the North American Mermaid - 3 stars - A cute little short-short story. Robert Reed - Every Color of Invisible - 4 stars - A new story in the life of Raven, a boy in a secret Native American tribe. Some of the back-stories are getting a little bit too odd. Geoff Ryman - This Constant Narrowing - 2 stars - All the women disappear. Then all the transgenders disappear. Then all white people, then black, then yellow until only Latinos are left. No explanation. Creating a very weird fantasy situation in order to make some point about homosexuality? Nina Kiriki Hoffman - Other People's Dreams - 5 stars - A well done story about people who weave stories and dream energy into special devices to help people to have the dreams that they want/need. Jerry Oltion - Science: Space Drives - 4 stars - A survey of different methods which can/could be used to travel through space. Warp drive, anyone? Nick DiChario - The Baron and His Floating Daughter - 4 stars - A nice fantasy about a baron and his daughter who floats away unless special precautions are taken, and what happens to his barony when he tries to protect her. J. R. Dawson - When We Flew Together Through the Ice - 3 stars - A weird story about a woman, her two daughters and their self-righteous life of crime, including murder. I couldn't enjoy reading it. Maybe 2 stars. Bo Balder - The Island and It's Boy - 4 stars - A fantasy about islands that live, grow and age and the people that live on them. What happens when a young man in the tribe wants to go against tradition? 7 • Thanksgiving • 10 pages by Jeffrey Ford Good/OK. Uncle Jake started coming to Thanksgiving dinner fifteen years ago, now it's just supposed to be the five of them, but Jake didn't get the memo. Whose uncle is he anyway? Next year let's eat out. 17 • The Lady Of Butterflies • 25 pages by Y. M. Pang Excellent. A young woman mysteriously appears on the palace grounds. Rikara, first sword of the emperor, immediately protects her charge. They find that the woman is harmless, the emperor is attract 7 • Thanksgiving • 10 pages by Jeffrey Ford Good/OK. Uncle Jake started coming to Thanksgiving dinner fifteen years ago, now it's just supposed to be the five of them, but Jake didn't get the memo. Whose uncle is he anyway? Next year let's eat out. 17 • The Lady Of Butterflies • 25 pages by Y. M. Pang Excellent. A young woman mysteriously appears on the palace grounds. Rikara, first sword of the emperor, immediately protects her charge. They find that the woman is harmless, the emperor is attracted to her, and she becomes a guest of the royal court. Rikara has the responsibility of teaching Morieth the language and customs of Keja. 42 • Extreme • 14 pages by Sean McMullen Good+. George Kensington is a psych-x. He has a genetic marker that requires him to seek extremes. After his last adventure he is approached by a woman he calls Husky. What she wants is unclear but he's smart and resourceful and does a good job of putting the pieces together. The first being when she said "we" and he knew that she represented a group. 73 • The Iconoclasma • 31 pages by Hanus Seiner OK+. Humanity has discovered how to create and bring to life icons. Entities that aren't bound by normal space time. Allowing us have explored the stars. Unfortunately creating icons also creates or attracts the attention of iconoclasmas. We don't use icons any more, but back when we did...Michal and the rest of maintenance crew four are outside when every door in Terbius is opened and the entire crew jettisoned into space. Terbius is one of eight dreadnoughts protecting the Sostenuto. The Terbius is the biggest thing to date that an iconoclasma has manipulated. There is now a struggle to keep the Terbius from destroying Sostenuto and the millions that depend on that station. 104 • Overwintering Habits Of The North American Mermaid • half page by Abra Staffin-Wiebe OK. Short documentary, see title, which takes more space than the text. 105 • Every Color Of Invisible • 38 pages by Robert Reed Good/OK. Raven Dream helped Mara and Greggie when their plane crashed. Raven killed One-Less when he tried to kill them. Raven was then sent to live with his uncle who teaches his students how to live in nature. It is mostly world building from the perspective of Raven who uses different terms, which took time for me to understand. At the beginning of the story I thought there were two separate dimensions one where the People lived and one inhabited by demons. 145 • The Constant Narrowing • 28 pages by Geoff Ryman OK. Horror. One night all the females in the world disappeared. Horror because no talk of research into why this happened or the lack of children and the human race dying out. What we see is the society that is left. Some rich guy has shot Gregorio in the foot to woo him, to be his daddy. Gregorio makes it to the hospital, but this guy finds him and won't leave his room. No real sympathy from the staff, no investigation into the shooting, this kind of thing is taken for granted. 173 • Other People's Dreams • 17 pages by Nina Kiriki Hoffman Excellent/VG. Rowan gets a commission to build a dream. She never leaves the planet, but has to go to the moon for this job. She can't turn it down, it's too much money and it's someone she knows. Another innovative idea from Hoffman and great character dynamics. Bardo is telling the story and we can see that Rowan isn't just his boss, she's the closest to a parent he's had since his family was killed on his home planet when he was nine. Then we get to see into Rowan. 204 • The Baron And His Floating Daughter • 15 pages by Nick Dichario Very Good+. Prince Antonio comes to a small island near Sicily to find a wife. He finds the castle in a bit of disarray, but is utterly charmed by Levita even though she is floating trapped against the ceiling. It is like a fairly tale, the beautiful princess in a predicament, the handsome prince striving to free her, and the fathers not agreeable to marriage unless there is a solution. 219 • When We Flew Together Through The Ice • 17 pages by J. R. Dawson Good+. Merribelle, Sarah and Mom took a ship for a four hour tour of a comet. They got too close and died. Well that's what the dad thought. They just took off and became nomads and scavengers. Mom had an operation done on Merribelle that put C-9 in her head. This conscience is always putting thoughts into her head. Sometimes good things like, don't forget to turn of the burner, but often intrusive stuff. She doesn't feel like she is the same person, but can't put a finger on it. She remembers running through the fields as a child not worried about a misstep, i.e. C-9 would be shouting warnings at her if she tried something like that now. 236 • The Island And Its Boy • 18 pages by Bo Balder Very Good/Excellent. Inu's people live on an island that circles the pole. A small island has appeared in their view. Yes, the roots on their island have grown too deep, it will be caught by the southern currents. Inu doesn't want to leave the island. He makes his plans to stay. Great job of world building, charming characters. An above average issue with interesting stories by Y.M. Pang, Hanuš Seiner (translated by Julie Novakova), Nina Kiriki Hoffman and Bo Balder. - "Thanksgiving" by Jeffrey Ford: a Thanksgiving dinner takes a strange turn when the members begin to realise that one of their relatives isn't really known by anybody there at all. Various hypothesis are provided for his presence but it all comes to a head when he appears at the next Thanksgiving and their probing questions begin to reveal that all is not An above average issue with interesting stories by Y.M. Pang, Hanuš Seiner (translated by Julie Novakova), Nina Kiriki Hoffman and Bo Balder. - "Thanksgiving" by Jeffrey Ford: a Thanksgiving dinner takes a strange turn when the members begin to realise that one of their relatives isn't really known by anybody there at all. Various hypothesis are provided for his presence but it all comes to a head when he appears at the next Thanksgiving and their probing questions begin to reveal that all is not what it seems. - "The Lady of Butterflies" by Y.M. Pang: an interesting story about a lady who suddenly appears in the garden of an Emperor with little memory of who she is or how she got there. The viewpoint character is the Emperor's swordsperson, who is assign the task of educating the lady. When a violent confrontation occurs after a foreign king appears, more is revealed about the origins of the strange lady and the apparent attraction of butterflies to her. In the end, the swordsperson must decide where her loyalties lie: with the Emperor whom she is to protect or with the lady with whom she had developed at attachment to. - "Extreme" by Sean Mcmullen: a man who likes to push himself to extremes meets an unknown, possibly very rich woman, who offers him an extreme assassination job. But that would only prove to be a test, for the woman wanted to see if his was a fit candidate for a coming change to the world where his skills at surviving in extreme conditions would be needed. - "The Iconoclasma" by Hanuš Seiner, translated by Julie Novakova: a fascinating tale of a future where a geometric form of life can be summoned into existence. With their help, mankind can leap for the stars. But with the lifeform comes danger in the form of a predator of that lifeform that would now also like to devour humanity. In the end, humanity has to decide whether the ability to travel to the stars is worth the danger. - "Overwintering Habits of the North American Mermaid" by Abra Staffin-Wiebe: flash fiction about mermaids in winter. - "Every Color of Invisible" by Robert Reed: set in a future with other Reed stories where a young Native American boy is getting an education when remaining 'hidden' from the rest of the world. In this one, the repercussions of the rescue of a rich man's children in another story would be revealed when the boy learns that his hiding days may be over. - "This Constant Narrowing" by Geoff Ryman: an uncomfortable tale of a time where women have vanished, leaving behind men, some of who unleash sexual-tinged violence on the remaining men. In this tale, the protagonist is injured by a sexual predator as a 'trophy'. As he recovers and tries to avoid the predator's attention, he reflects on his life without women, with other men and with a world where other groups of people are gradually vanishing unpredictably. One odd thing about the story is how the rest of the world seems to go on much as it is despite huge numbers of people vanishing without a trace. - "Other People's Dreams" by Nina Kiriki Hoffman: an interesting tale about an artist and apprentice whose job is to weave together dreams made up of threads and 'living dream energy' for their customers. Then an unusual job with a high payoff arrives involving a person from the artist's past arrives and we get a deeper look into the world of dreams and what it is capable of doing to the living. A nice tale with a background that bears revisiting with more stories in the future. - "The Baron and His Floating Daughter" by Nick Dichario: the usual fairy tale setting where a Prince sets out to woo the daughter of a Baron. The daughter really floats and the Prince has made it his goal to find a cure for her condition. But when time runs out, the tale takes a twist and subsequent events show that this story's happily ever after may not involve the Prince at all, or a cure for the daughter. - "When We Flew Together Through the Ice" by J.R. Dawson: a gritty story of a mother who escapes into space with her daughters for a life among the stars. But this life may not all be sweet as the daughters rebel in their own ways, with out fitted with a AI control who whispers commands to her consciousness. As time goes on and their lives change, it becomes harder to tell which actions are by the daughter and which by her controller, leading to a final action that will change their lives. - "The Island And Its Boy" by Bo Balder: a fascinating tale about a village that lives on an island that can actually move, react and communicate with its inhabitants. The island circles the world near the arctic north, giving the people an Inuit like culture. But change comes when a 'baby' island is spotted, signalling that the current island has grown too big and will move south with the currents and the people make plans to move to the new island. But one boy, in this culture where women are dominant, has other plans as he has grown used to the big island and wants to stay there as it goes south. The story looks as his secret plans to stay put along with other followers while his ruling mother plans the move to the baby island. Secrets, traps and counter plans pile up until the moving day arrives. This issue had a wonderfully diverse mix of stories, with my favorites heavily weighted to the very beginning and end. - “Thanksgiving” by Jeffery Ford is a fun exploration on the matter of an unwelcome, uninvited guest to the feast. As I read this on the long drive to a Thanksgiving gathering, I was especially amused by the story. - “The Baron and His Floating Daughter” by Nick DiChario. I loved this original Italian fairy tale, especially the twist at the very end. - “The Island and Its Boy” by This issue had a wonderfully diverse mix of stories, with my favorites heavily weighted to the very beginning and end. - “Thanksgiving” by Jeffery Ford is a fun exploration on the matter of an unwelcome, uninvited guest to the feast. As I read this on the long drive to a Thanksgiving gathering, I was especially amused by the story. - “The Baron and His Floating Daughter” by Nick DiChario. I loved this original Italian fairy tale, especially the twist at the very end. - “The Island and Its Boy” by Bo Balder. The world fascinated me, with its living islands that travel currents through the sea, but the characters were fantastic, too. I want to pick on one story here, not because it's bad—it isn't—but because I think it demonstrates a common failing in this magazine. The story is "Every Color of Invisible" by Robert Reed. As I gather from the intro, this is the latest in a series of stories going back more than 10 years. I'm sure this is a fine story. Reed is an excellent writer whose work I enjoy, but this story failed as a standalone. I could not figure out who the characters were. I could not see where they were or what th I want to pick on one story here, not because it's bad—it isn't—but because I think it demonstrates a common failing in this magazine. The story is "Every Color of Invisible" by Robert Reed. As I gather from the intro, this is the latest in a series of stories going back more than 10 years. I'm sure this is a fine story. Reed is an excellent writer whose work I enjoy, but this story failed as a standalone. I could not figure out who the characters were. I could not see where they were or what they were doing. I certainly couldn't understand why they were doing it. I was lost. After maybe 10 pages, I gave up. I suspect this story would have been far more engaging if I had read the previous five stories, but I hadn't and that stopped me from following this one. This has happened a lot in F&SF lately. The saurs cover story in March/April 2017 was almost as incomprehensible though I did make it to the end of that one. Naomi Kritzer's Seastead stories have teetered on the edge of this problem, if not quite tipped over, perhaps because they've been published closer together and more recently. This isn't true of all continuing series. I had no trouble dropping into Matthew Hughes' Archonate stories in media res. Laidlaw's Spar and Gorlen stories are equally enjoyable. Ditto Phyllis Eisenstein's Alaric the Minstrel. Perhaps these work better precisely because they exist in well-trodden sword-and-sorcery worlds, and the characters are familiar archetypes. The stories could take place in almost any order without noticeable confusion. But overall, publishing stories in ongoing series is a big risk, the more original the world is the riskier it is. Before publishing, it's worth considering whether such a story will be accessible to a reader encountering its world and characters for the first time. A solid edition. Particular standout stories for me were The Lady of Butterflies by Y. M. Pang, Other People's Dreams by Nina Kiriki Hoffman, The Baron and His Floating Daughter by NHick DiChario, When We Flew Together Through the Ice by J. R. Dawson, and The Island and its Boy by Bo Balder. I wanted to like the Ryman story, but had to give up about halfway through. Still, that's the only one that I did not at all connect to, and mostly everything else was decent. I think the Iconoclasma was pro A solid edition. Particular standout stories for me were The Lady of Butterflies by Y. M. Pang, Other People's Dreams by Nina Kiriki Hoffman, The Baron and His Floating Daughter by NHick DiChario, When We Flew Together Through the Ice by J. R. Dawson, and The Island and its Boy by Bo Balder. I wanted to like the Ryman story, but had to give up about halfway through. Still, that's the only one that I did not at all connect to, and mostly everything else was decent. I think the Iconoclasma was probably quite good, but I struggled with reading it because I think it requires a math background I don't have to appreciate it fully. It's hit and miss, but that's to be expected in any collection. My favorite was "The Iconoclasma," which I felt had a solid science-fiction premise that really got me thinking. The opening scene was pretty striking, and all along there were fascinating ideas (like the constantly rolling planetary station). I also really appreciated "When We Flew Together Through The Ice." I want to say I enjoyed it, but it would me more accurate to say it infuriated me—but I think that's what the author was going It's hit and miss, but that's to be expected in any collection. My favorite was "The Iconoclasma," which I felt had a solid science-fiction premise that really got me thinking. The opening scene was pretty striking, and all along there were fascinating ideas (like the constantly rolling planetary station). I also really appreciated "When We Flew Together Through The Ice." I want to say I enjoyed it, but it would me more accurate to say it infuriated me—but I think that's what the author was going for. It was so tragic and frustrating, in a good way. It brought up some interesting ethical questions. There were other decent stories in this mix, but those were my two favorites. I thought this a particularly strong issue of F&SF. As usual, the fiction covers a broad range, from science fiction with a mathematical bent, to Asian-imbued high fantasy, to a story so dark it is preceded by content warnings. Of the eleven stories, all of which were rewarding, I will single out my six favorites. "Iconoclasma," the mathematically-minded novelette by Hanus Seiner, is notable for its use of topology and also for being translated from Czech, both of which I appreciated. It's go I thought this a particularly strong issue of F&SF. As usual, the fiction covers a broad range, from science fiction with a mathematical bent, to Asian-imbued high fantasy, to a story so dark it is preceded by content warnings. Of the eleven stories, all of which were rewarding, I will single out my six favorites. "Iconoclasma," the mathematically-minded novelette by Hanus Seiner, is notable for its use of topology and also for being translated from Czech, both of which I appreciated. It's good to get a taste of non-English-language science fiction, and Julie Novakova's translation is lucid and eloquent. I found the story unusual and intriguing, though the premise wasn't entirely persuasive to me. 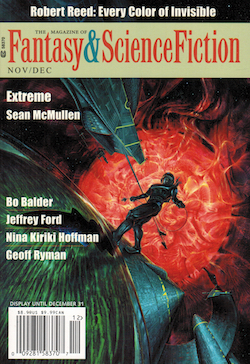 Sean McMullen's short story "Extreme" was a compelling, memorable, and dark science fiction tale about taking life to the limits. I didn't find the ending quite as strong as the rest, but it was an effective story. J. R. Dawson's science fiction short story "When We Flew Together Through the Ice" is well-told and poignantly affecting. Crucially, it succeeded in making me care strongly about its characters, and I very much wanted the protagonist to find some measure of happiness. "The Island and Its Boy" has a rare sweetness that is never simplistic. Though the premise is far-fetched, Bo Balder's storytelling skill made me suspend my disbelief. I especially liked the way that the tale stepped back from taking the expected turns. Nina Kirikia Hoffman's "Other People's Dreams" is another very sweet story, my favorite of the seven short stories. For me, it falls into the category of science fantasy, encompassing both dream-making and spaceflight, though others might read it as straight science fiction. I don't want to give spoilers, but there is a scene near the end that I found exceptional. Last but far from least, my favorite of the issue's four novelettes is Y. M. Pang's beautifully-written fantasy tale "The Lady of the Butterflies." Set in an Asian-flavored milieu, the story swept me into its world and I didn't want to leave. I found it satisfying from start to finish, its narrator distinctive and sympathetic, and my unfolding understanding of the eponymous Lady of the Butterflies never hitting a wrong note. My favorite stories: - THE BARON AND HIS FLOATING DAUGHTER - Nick DiChario. Rule #1 - always look up. - THANKSGIVING - Jeffrey Ford. Two things that no one can remember - the cranberries and Uncle Jake. - WHEN WE FLEW TOGETHER THROUGH THE ICE - J. R. Dawson. When one parent grabs the kids, steals an RV spaceship and runs, how do the kids deal with it... especially when Mom zooms between three comets to make everyone think they all died? Nice representation of what it would be like to have a cyber-i My favorite stories: - THE BARON AND HIS FLOATING DAUGHTER - Nick DiChario. Rule #1 - always look up. - THANKSGIVING - Jeffrey Ford. Two things that no one can remember - the cranberries and Uncle Jake. - WHEN WE FLEW TOGETHER THROUGH THE ICE - J. R. Dawson. When one parent grabs the kids, steals an RV spaceship and runs, how do the kids deal with it... especially when Mom zooms between three comets to make everyone think they all died? Nice representation of what it would be like to have a cyber-induced obsessive-compulsive disorder. - THE ISLAND AND ITS BOY - Bo Balder. Normally you have to leave home to have grand adventures. - THIS CONSTANT NARROWING - Geoff Ryman. What if God took a page from Facebook data-mining and decided to slowly break us up into ever-narrowing demographic niches? Reminiscent of Phillip Wylies' Disappearance, but with the focus on the emotional breakdown of society.